We recently discovered at the library a unique streetcar schedule which represents what we believe is the first schedule of the Calais Street Railroad. If we are wrong in this assumption Richard Auletta, our streetcar expert, can correct us. 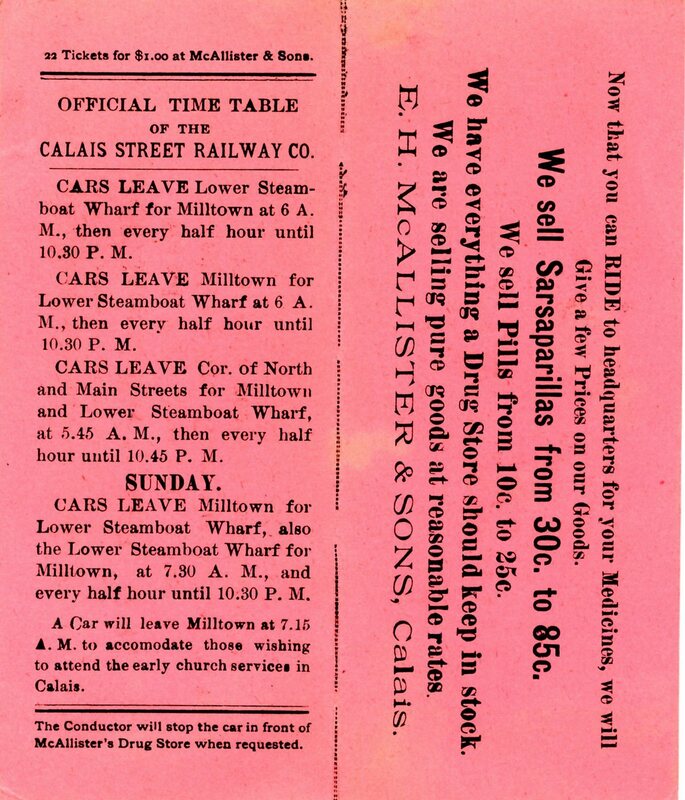 The schedule was published by E.M. McAllister, a druggist with a store on Main Street in Calais by way of promoting Sarsaparilla and “pills from 10 cents to 25 cents”, what sort of pills is left to the imagination, together with discounted streetcar tickets. We do note that Sarsaparilla was considerably more expensive than pills in 1894. 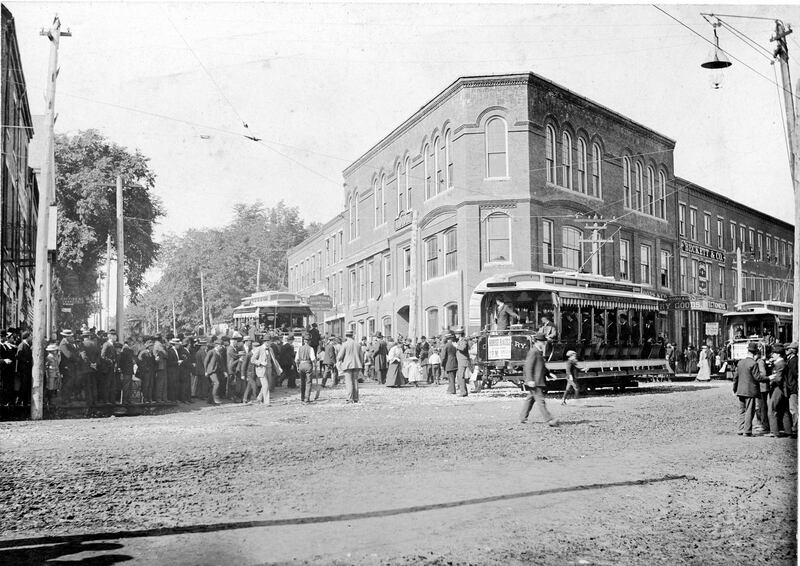 The streetcar system was designed and built as an international line with 7 miles of track, four on the U.S.side and three on the Canadian. On July 1st, 1894 the Calais Street Railroad officially began operating. Thousands from both sides of the border joined in the celebration at the corner of Main and North streets in Calais. The Calais Street Railway was one of only four international streetcars ever to operate in the U.S.A. The others were at Niagara Falls, N.Y.; Laredo, Texas; and El Paso, Texas. However as the schedule above indicates, the cars in 1894 ran only on the U.S side of the border from the lower steamboat wharf on Steamboat Street to Milltown. St. Stephen had the tracks and wires for the electric railroad but no service. 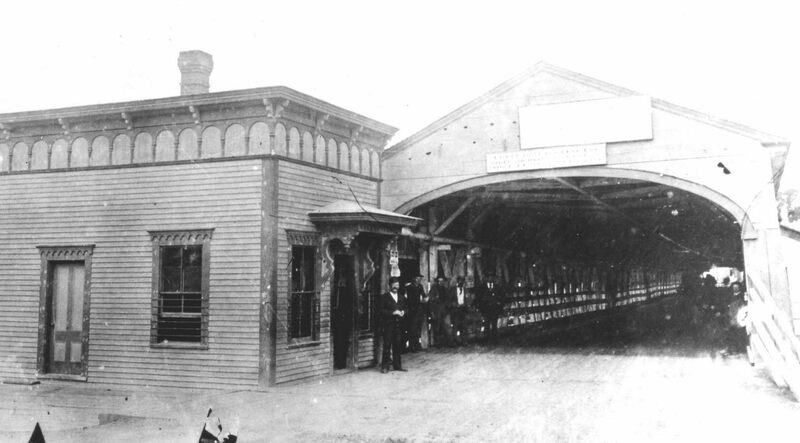 The reason the streetcars couldn’t connect with St. Stephen in 1894 is pictured above, the old covered bridge which connected Calais and St. Stephen at Ferry Point in 1894. It had been constructed in 1845 for horses and wagons and was structurally unable to bear the weight of a streetcar. A streetcar may have been able to get to St. Stephen by crossing at Milltown but it would have been a long trip for someone who just wanted to scoot across the border to visit a friend or perhaps buy a bottle of demon rum, legal in St Stephen but not in Calais. 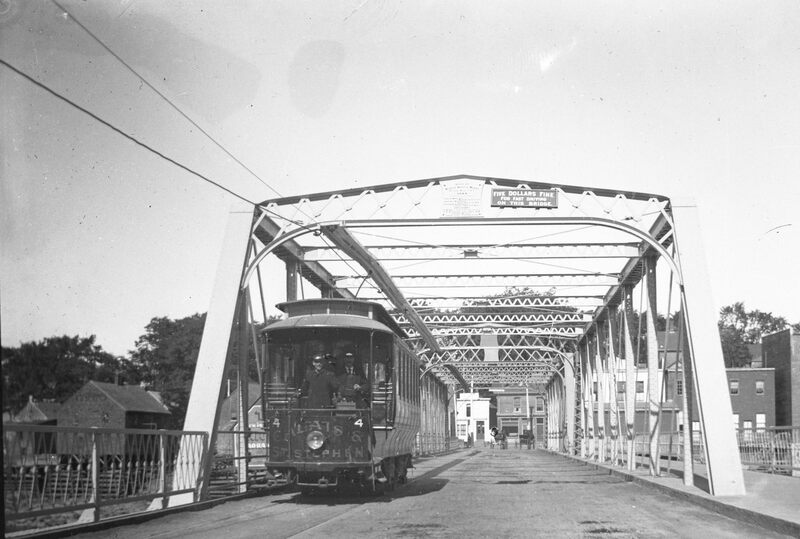 Fortunately even major construction projects like an international bridge were finished quickly in those days and by the summer of 1895 the old covered bridge was gone and the “steel bridge” was in place over the river allowing the streetcars to traverse the four towns, Calais, St. Stephen and the two Milltowns. The fare was 5 cents but if you purchased the tickets at McAllister’s a dollar got you 22 tickets. 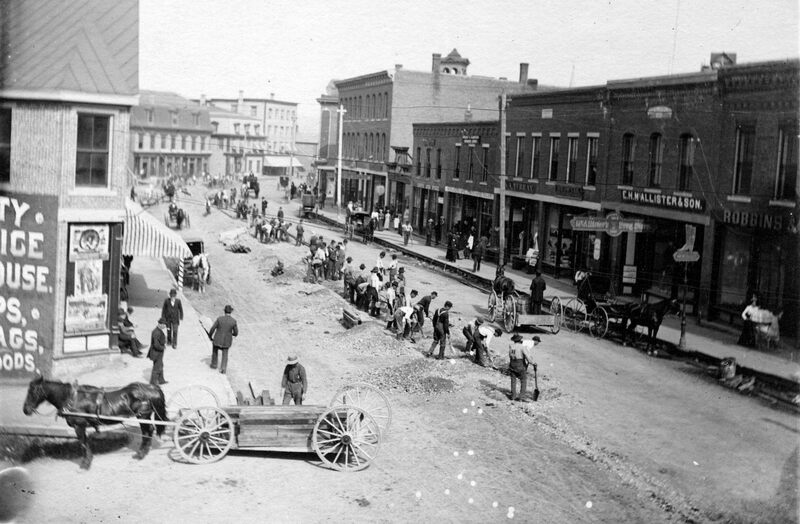 The photo above shows the laying of the rails for the streetcars in in 1893 or 1894 just in front of McAllister’s, most recently the Over and Under Pub next to the Calais Bookstore. McAllister’s Drugstore was in business for nearly a century in the same location although not the same building.Back in the 1800’s it sold all manner of patent medicines which cured nearly everything. Those with troubling bouts of hysteria was easily and cheaply cured with Dr. 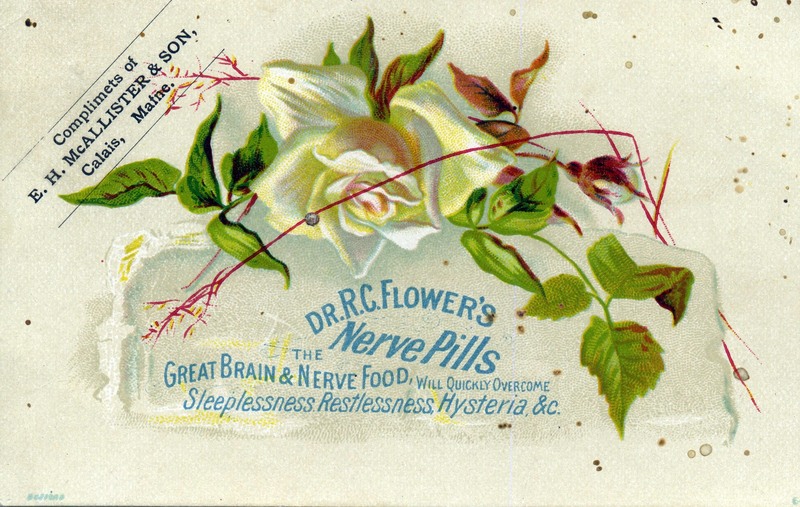 Flowers nerve pills. 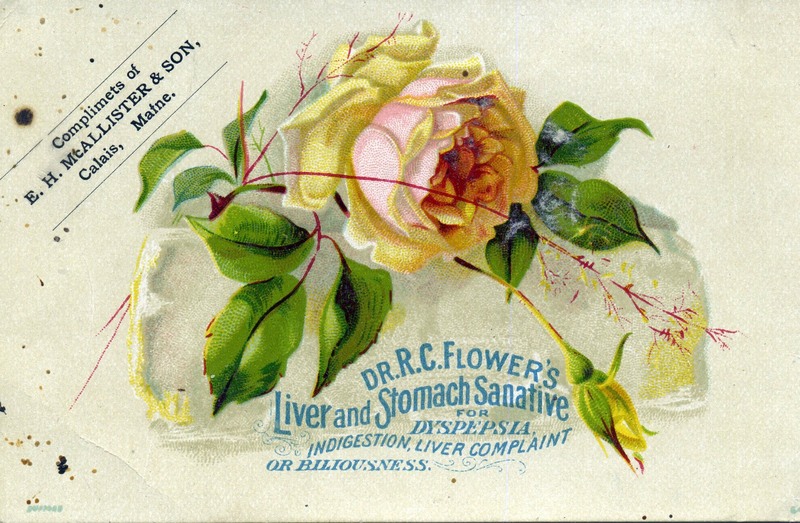 If the medical situation were more serious any number of tonics could be purchased at McAllister’s laced with opium which, at the very least, allowed the sufferer to forget how miserable he felt. 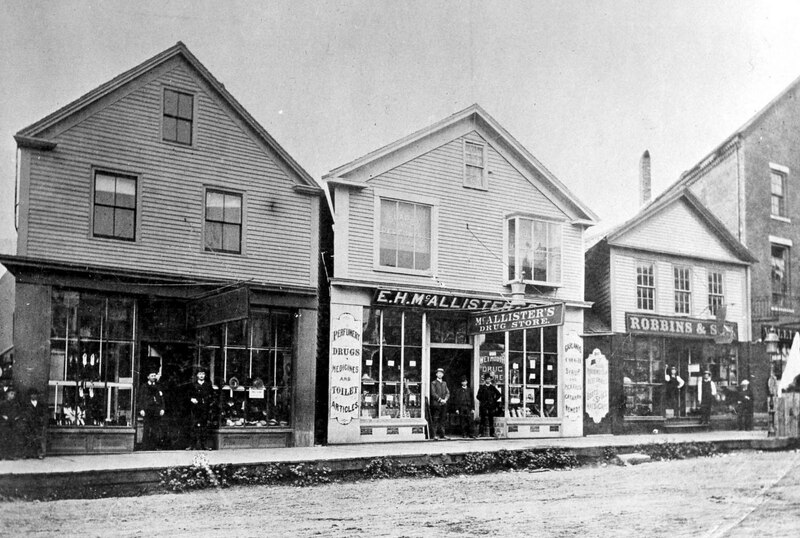 The original McAllister drug store was a wooden structure which was replaced by the brick block shown above in the 1870’s or 80’s.That brick block still stands and is the only four story structure in Calais. The Robbins and Sons building to the right of McAllister’s was most recently Maineline Studios. 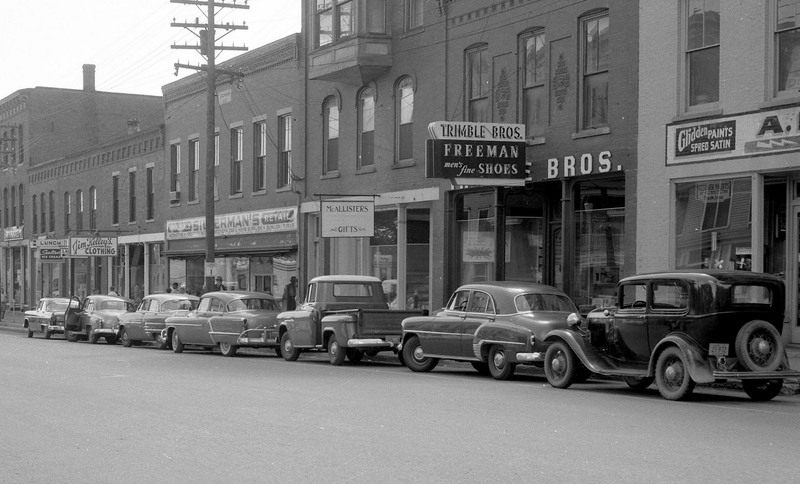 In its last life McAllister’s was no longer a drug store but a gift shop with Silverman’s, Jim Kelley and Jane Todd’s Lunch to the left and Trimble Brothers shoe store and Abe Levy’s store to the right. Many will remember making it a regular stop when spending a Saturday afternoon shopping on Main Street.